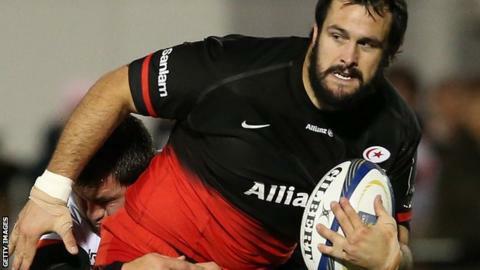 Saracens prop Juan Figallo saw his baby son born before lunch in Stevenage, and then left to help his side to Premiership victory by teatime. The Saracens player was told he could sit out the match against Gloucester, but insisted on racing to north London for kick-off soon after the birth. The 27-year-old came off the bench as a 14-man Sarries side won 25-12. "I gave him a big kiss and kissed my wife, then I asked her if I could play," the Argentine said. "It is a big, big day for me and my family. Having a kid is the most amazing thing. This is one of the best days of my life." Saracens director of rugby Mark McCall confirmed Figallo was "encouraged" not to play by the club, with the baby born at 11:30 GMT after a sleepless night for the new mum and dad in hospital. "He walked into the changing room to a big roar from the players at 2.15pm," McCall said. "At 12 we told him to stay where he was in Stevenage Hospital, that we'd manage. He hung around for 45 minutes after the baby was born and then came down. He wanted to come and help the team." Saracens were temporarily down to 13 men in the first half, with Brad Barritt sin-binned before Schalk Brits was red carded for punching Nick Wood. Figallo joined the action immediately after the break, with McCall praising the pack for helping Saracens move eight points clear at the top of the table with what he described as their "best win of the season". Last Sunday, rugby league player Jamie Shaul missed the arrival of his first child to help Hull FC secure victory against Catalans Dragons.